When it comes to dining out, nothing turns me off faster than discovering that a restaurant's kitchen relies heavily on frozen or prepared foodservice supply products. I just do not understand the appeal of ordering something that I can buy at Costco, Sam's Club, or Smart & Final. My bottom line principle is this: re-heating some SYSCO product is not cooking, and if I am going to eat something of that nature, it will be in the convenience of my own home, not in some hack "restaurant." It is because of this maxim that I took particular interest in Ritual Tavern, a relatively new restaurant and bar in North Park. The word was that their kitchen prepared the menu items from scratch, using high quality ingredients, and that they had an esoteric beer selection to boot. This sounded like my kind of place, so I recently visited for dinner in order to see if the rumors were true. 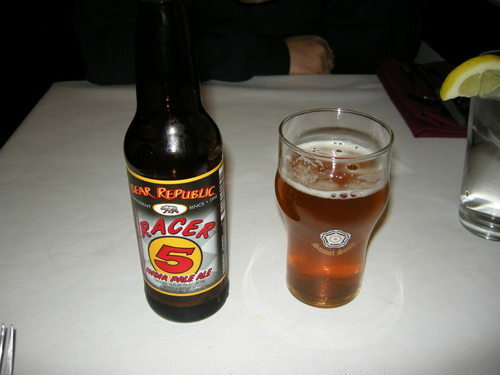 After perusing the beer list I settled on the Bear Republic Racer 5 ($4.50). Let me start by saying that the beer list is fairly extensive, with eight local micro-brews on tap, and over 40 well-chosen bottled beers as well. Even the most knowledgeable hopheads should be able to find something that they will enjoy. Being an IPA fan, I found the Racer 5 suited my tastes, and the 7% alcohol content was respectable as well. Since I am an enthusiast of ALL onion rings, great and small, I had to order the House Onion Rings with home-made remoulade ($5). 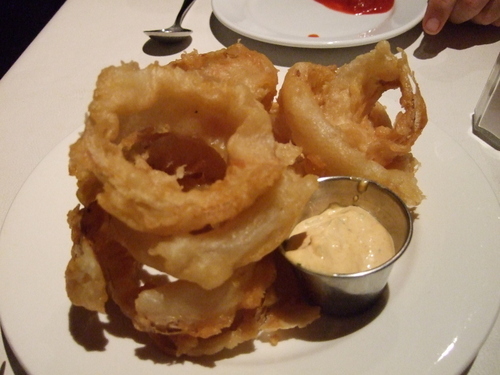 The rings featured a Kolsch ale batter, and were deep fried to a perfect golden brown. The hand cut onions were sweet, and retained the right amount of crispness, providing a pleasing mouth feel. These rings were outrageous, and the only problem was that I did not order enough. 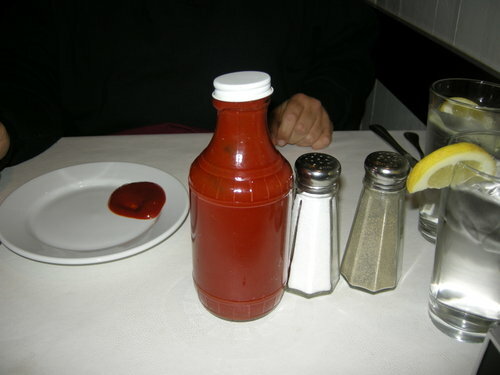 Notice anything unusual in the photograph of the Ketchup bottle? That's right, no label. Ritual Tavern takes the house-made concept so seriously that they even make their condiments from scratch, including the ketchup, Dijon mustard, pickle chips, hot sauce, tarter sauce, and remoulade. Besides the ketchup, I also sampled the remoulade, the hot sauce, and the tarter sauce, all of which proved to be excellent. The pie features Niman Ranch lamb and beef, which was fresh and flavorful, demonstrating RT's commitment to quality. Other ingredients include parsnips, carrots, and green beans, all topped with fluffy toasted mashed potatoes. 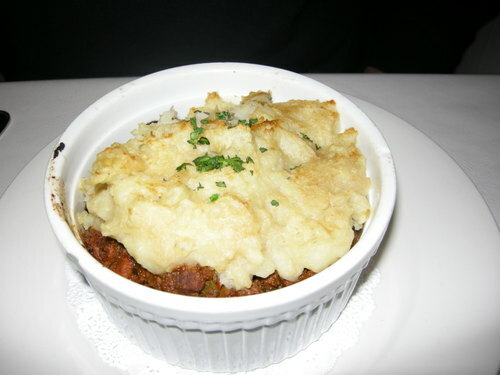 I found this to be a top notch rendition of Shepard's pie. 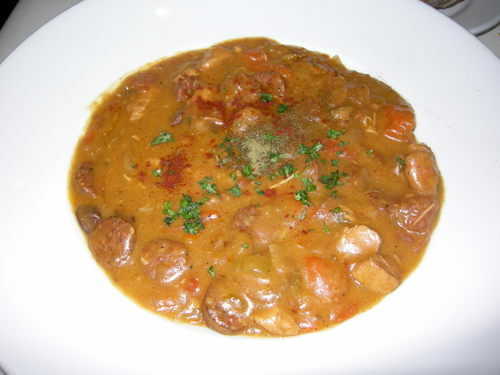 For my next entree, I switched gears to southern comfort food, and ordered the Saddlebrush Gumbo ($14.00). Chef Glenn Farrington's version of this bayou classic boasted Jidori chicken, Mexican shrimp, and Niman andouille sausage. As you might have guessed, with an ingredient list such as that, the final product was delicious. This gumbo had a thicker, etouffee-like consistency that I really enjoyed, and finished with a noticeable amount of spicy heat. Though this was not a hard-line Louisiana style preparation, I highly recommend it nonetheless. 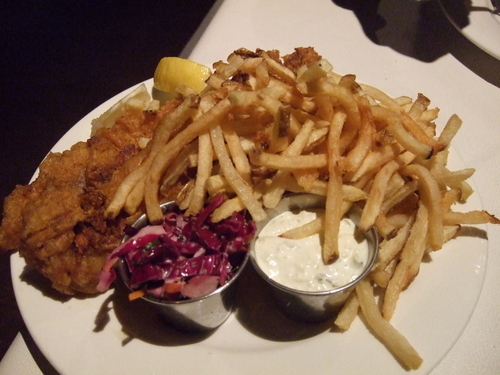 I wound up my evening of gluttony with an order of Fish And Chips ($13.00). The intriguing twist here was the use of domestic farm raised catfish rather than the more traditional cod. The impact was that after biting through the nicely crisped and flavorful batter coating, I was treated to catfish fillets that melted in my mouth like butter. While different from the flaky texture of cod, the catfish made for an interesting and tasty variation on this British standard. Also worthy of note in this dish was the house-made tartar sauce that I would, and did, happily eat by itself with a spoon. 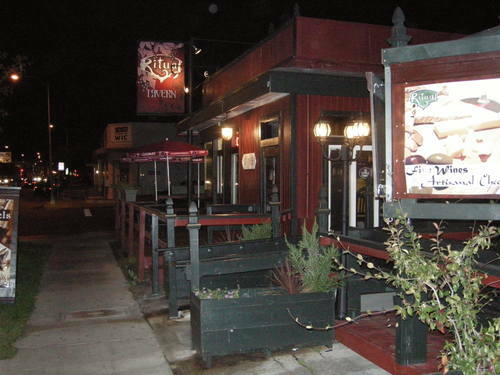 There is much to like about Ritual Tavern: hands on owners Mike Flores and Staci Wilkins, a cozy and welcoming atmosphere, efficient and friendly service, reasonable prices, and an outstanding beer selection. What really sets this establishment apart from the pack, however, is the attention given to quality ingredient selection, and a strong commitment to "made from scratch" cooking. There is one thing about this operation I am sure of, North Park's SYSCO and U.S. Foodservice reps will not be getting rich off of them anytime soon.